We got a few concepts together for the first poster. Be sure to browse through each section, each concept has more than one image. 1. The slide show below has a handful of images based on the same concept. 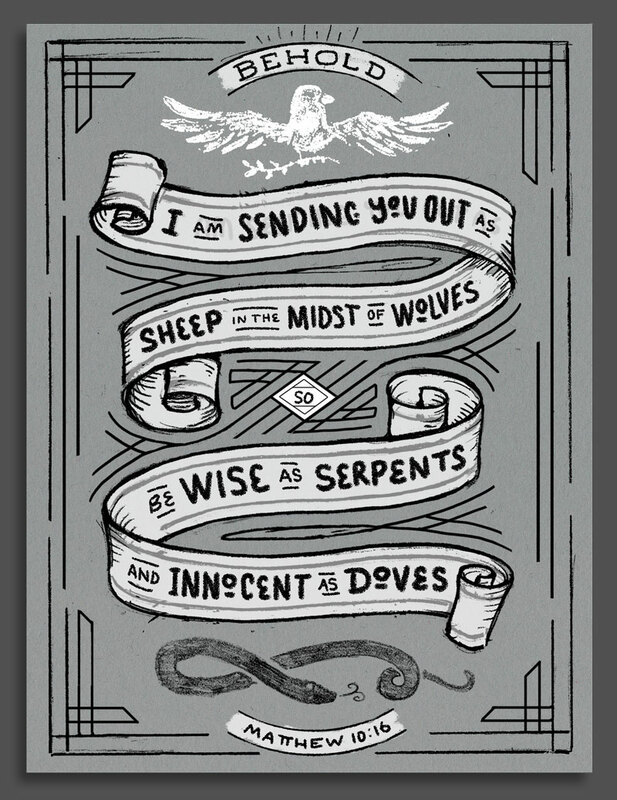 This one focuses on imagery from what you are encouraged to be, wise/serpent and innocent/dove. This sketch was taken through a few steps of refinement, showing potential color and detail. The use of metallic gold in the print could really make for an impressive poster. As you can see, like for the logo, this composition is extremely balanced and symmetrical. The serpent and dove become refined through the sequences (the last slide shows a more detailed shot of them in their more refined state), however the scrolls and type are still very rough. 2. This concept uses the silhouette of the metaphorical wolf, a reminder of why you needs adopt the qualities of the serpent and dove. The type is fairly simple in this sketch, whereas the final would have a variety of sizes and styles, while maintaining a hand drawn feel. 3. Similar to the first sketch which sets the type into a dynamic composition, this concept would use dynamic type to create or contribute to the composition. Being a sketch, the verse is just mocked up with some random fonts to give an idea of how the passage could be broken up. If chosen the type would be the main focus in this concept and would be far more interesting and dynamic than what is mocked up here.